The first Nettuno pen was made in 1911 by Umberto Vecchietti in Bologna. 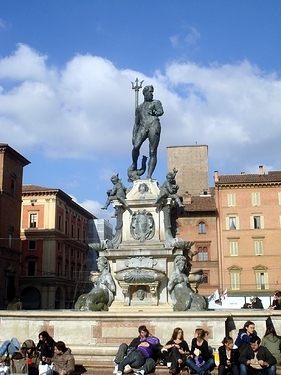 The Nettuno name was inspired by the “Fontana del Nettuno”, the fountain of Neptune. The center figure of this fountain is Neptune, the Roman sea god, holding his trident - which trident became the symbol of the Nettuno pens. In fact if you check out for example the current Nettuno 1911 fountain pen you will see this trident emphasized on the clip. The original Docets were made in the 1940s and were the first piston fillers of Nettuno. They were quite popular back then. Unfortunately the company went under in the fifties mainly due to the arrival of the ball pen. In 2007 Aurora acquired the rights from the Vecchietti family to manufacture & issue pens under the Nettuno brand. 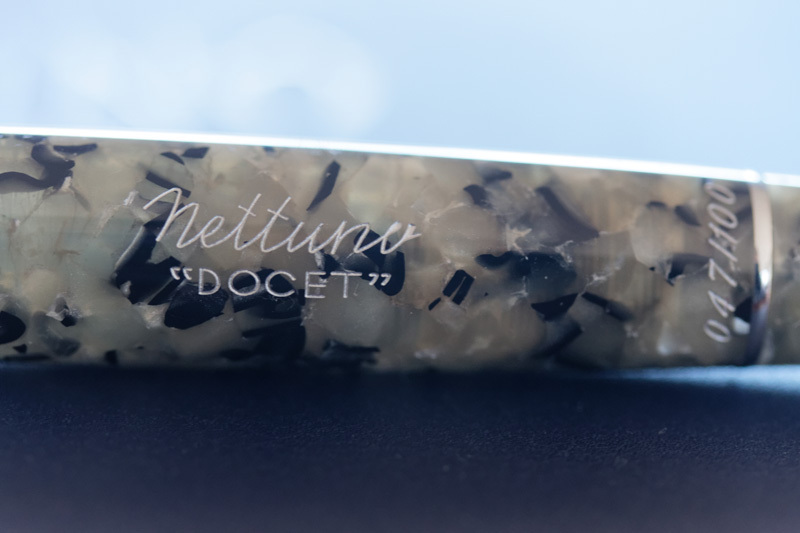 The new Docet was released to celebrate the 100th anniversary of Nettuno. The pen is not an exact copy of the original Docet, but it has several vintage-inspired details some reminiscent of the original Docet. The outer cardboard box has some vintage inspired print on it. The top center of the box features a picture of the said Neptune statue but he is holding a fountain pen instead of the trident. Within the cardboard box is a blue faux leather box with the Nettuno 1911 logo embossed into it. The box has aluminium trims. The shape of the box and the aluminium trims gives the box some nice vintage feel in my opinion. Opening the box reveals the pen, a black Nettuno ink and a small booklet. The booklet provides some information on the history of the pen and filling instructions. 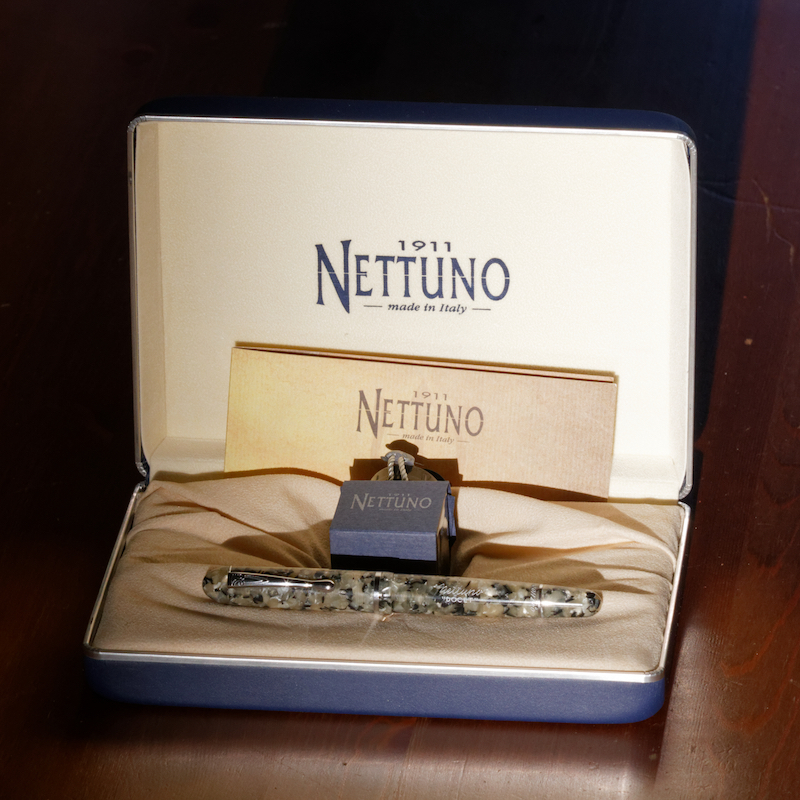 The ink is in a wax sealed small bottle covered with a cardboard paper with the Nettuno 1911 logo printed on it. There is no other indication about the ink. It’s colour is black. I’m not sure whether it is an Aurora Black or not. When I did an ink sample with a Q-tip, the 1st layer of the ink was deep dark grey rather than a black. Laying down a 2nd layer resulted in a more saturated black. Using a fountain pen the ink behaves well and is black. Water does not wash out the writing but it smears it to some extent. It’s less water resistant than a Mont Blanc Permanent Black or a Noodler’s X-Feather. 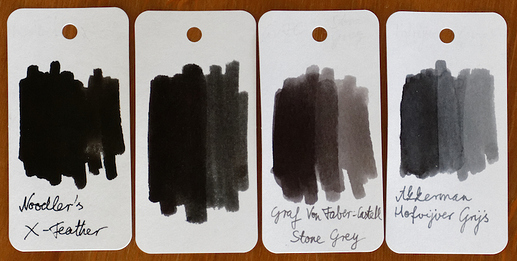 The Nettuno black doesn’t smear when dry. 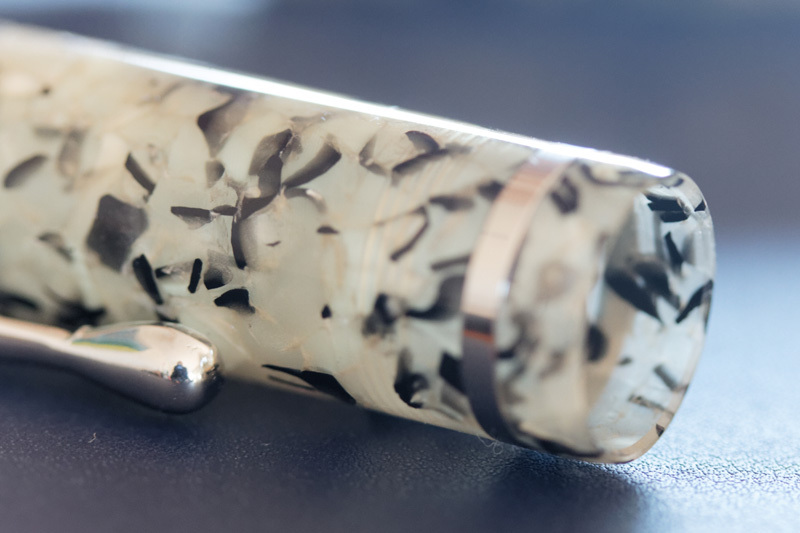 This is a gorgeous looking marbled pen. It has a very similar shape to the Aurora 88 (more on that later). The pen is made from Auroloid which is Aurora’s celluloid. Celluloid is porous and can absorb some moisture of the skin therefore it has a much more comfortable feel than resin. As you see, this grey marbled pattern is just beautiful. Held at the right angle, many of these grains look shiny which truly gives a marble-like look to the material. It is also somewhat opaque, which is visible on this photo taken from the cap. The bottom of the pen is a piston turning knob visually separated by a chrome trimmed ring from the barrel. Next to the ring the number of the pen is engraved into the pen. On the barrel Nettuno Docet is written. I’ve tried to find photos of '40s Docets and this engraving looks just like the original and gives a nice vintage look to the pen. The pen flares out slightly from the bottom. At the cap there is a small step up from the barrel to the cap. The end of the cap is tapered so the transition is smooth. The cap has one chrome trimmed ring which is clear, without engravings. It is similar to the cap ring of the original Docet which is a nice touch of detail again. The clip is tight and functional. There is a nice engraving on the clip. The pattern of this engraving is also in line with the other vintage looking elements. The cap ends in a rounded top. This is of course a screw-cap, and it takes one-and-a-half turns to unscrew it. The pen features a large Aurora 88 style ink window which is very readable. The piston rod has the same hollow end as well. This provides some extra ink reserve but it also makes cleaning the pen harder. 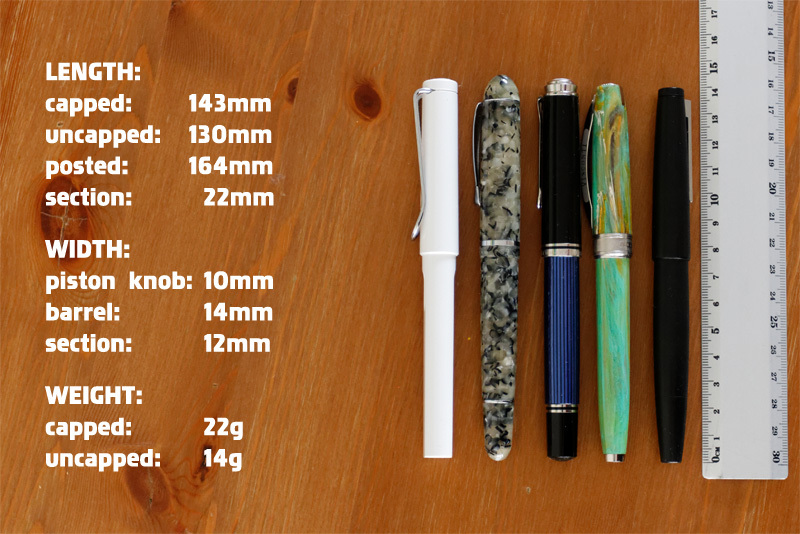 Unlike several Aurora pens the section of the pen is made from the same beautiful material as the barrel and the cap. The section tapers down slightly and flares out at the nib. Both the length and the width of the section is comfortable. The threads on the section are probably the smoothest threads I’ve ever felt. The nib is a size #6, 14k gold, chrome(?) 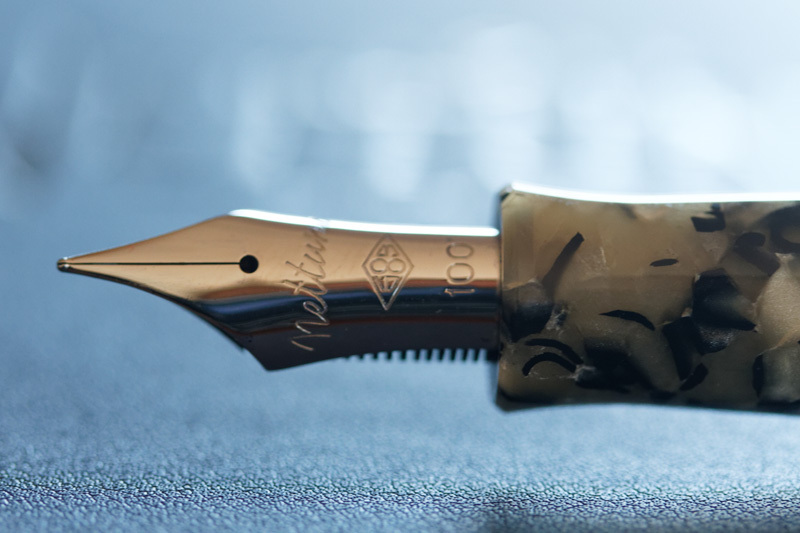 plated Aurora nib. The nib is stamped Nettuno and has a traditional nib design reminiscent of vintage pens. In fact, the original Docet did have a similar stamping. The number 100 on the nib refers to the 100th anniversary. The nib is a joy to write with though may not be everybody’s cup of tee. 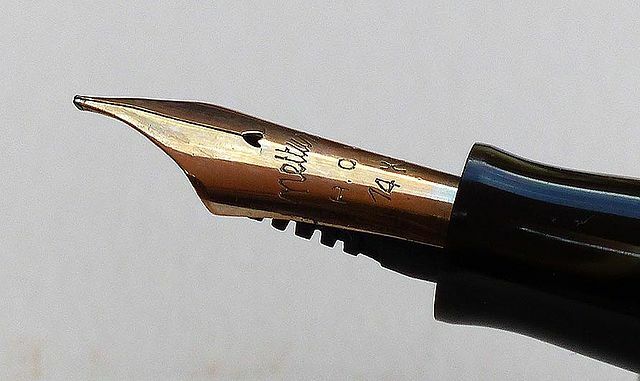 The nib glides smoothly and effortlessly on the paper but the nib is stiff, has no softness or flexibility to it and does not give any line variations. It is in this sense similar to the nib of a Pelikan M800 or a Parker Duofold. 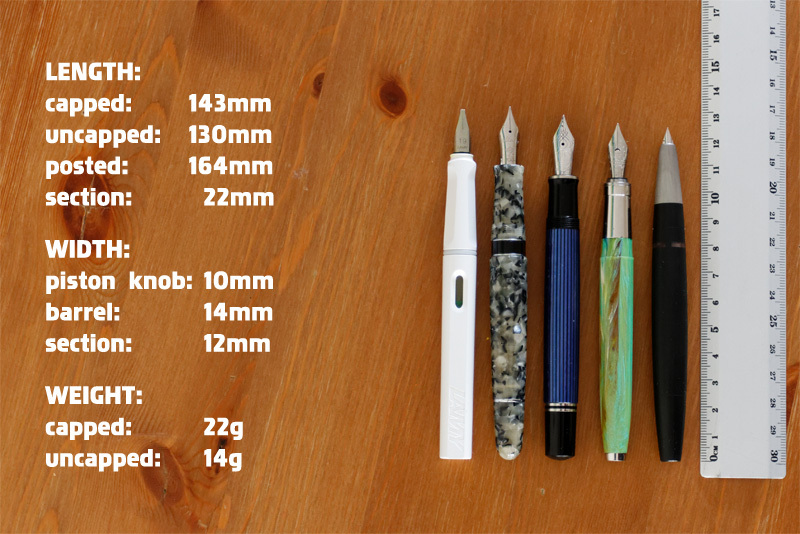 The size F nib produces a line width similar to ones made by other European F nibs. The feed is made of ebonite and functions perfectly. The feed keeps up, I haven’t experienced any hard starts or skips. Since the pen is made from celluloid, it is very light and comfortable for longer writing sessions. The pen is long enough to be used uncapped but can be posted as well. The cap does not throw off the balance of the pen significantly, but I find the pen to be a bit too long when posted. 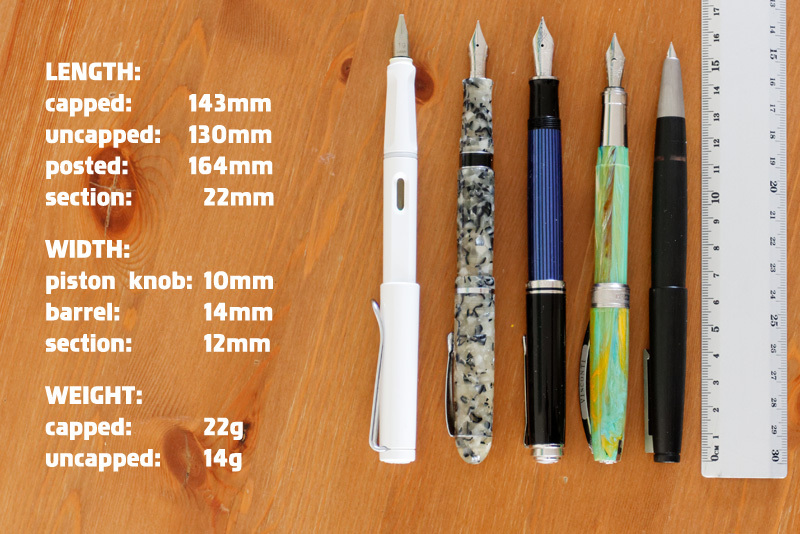 Here are some size comparisons to a Lamy Safary, a Pelikan Souverän M805, a Visconti Van Gogh and a Lamy 2000. I have a picture of the Nettuno Docet next to an Aurora 88 as well, which is a bit smaller than the Docet. I’ve read somewhere people being a bit disappointed that the Nettuno Docet is too much like an Aurora 88 and Aurora should have put more effort into the Docet. But I think that Aurora has made a sensible decision here to keep the manufacturing costs of this limited edition pen in check. Please bear in mind that this pen comes in 4 colours and each is limited to 100 pieces only. The price of the pen is €575, which is not cheap at all. (I was fortunate to get this pen for less than that.) The standard 88 comes at €495. You may look at this pen as a limited edition Aurora 88 if you wish – those are usually even more expensive. It’s up to ones own judgement whether the price can be justified. 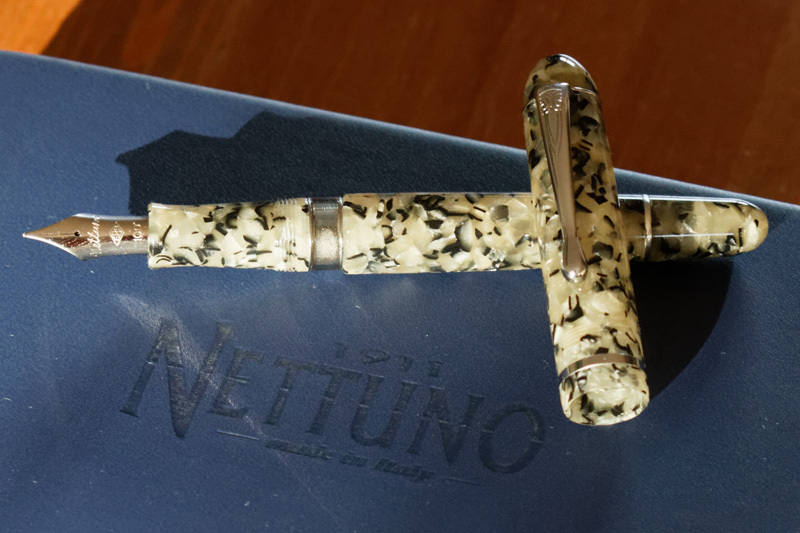 The Aurora 88, as a base model is a quite traditional-looking pen in itself but I’d like to emphasise that the Nettuno Docet in my opinion has enough mid-twentieth century details to really stand on its own. Aurora has paid attention to the details and featured several original Nettuno design elements on this anniversary release. All in all: in this set you get a pen with a stunning marbled material, the nib is absolutely fantastic and the craftsmanship is excellent, the overall look is vintage-esque and all this comes in a nice presentation. It took me more than a year to acquire this pen and as you may guess I think it was worth it. I’ve received permission to reuse original '40s Nettuno Docet photos so I added them to the review.